Age: circa 1900, Serial No. 502, Platen size 21.25” x 27”, Bed size: 24" x 30"
This press, manufactured by the Paul Shniedewend & Company, is a good example of comparative manufacturing. 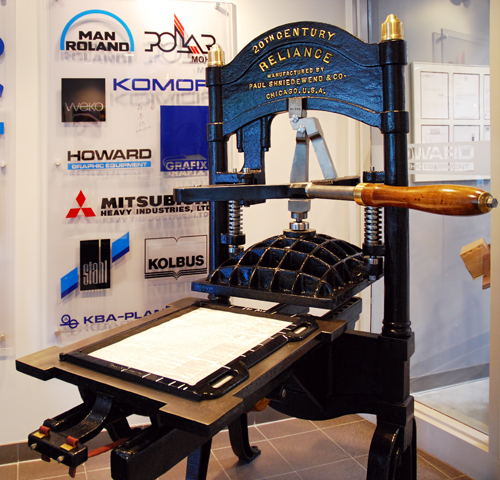 Many companies produced the Rust/Hoe designed iron press and this Reliance was essentially a carbon copy of the Hoe. Because of the 20th Century marking, we know this press was probably built after 1900 although this same maker and press was manufactured in the late 1800’s as well. Interesting fact: Paul Shniedewend and James Lee partnered in 1870. 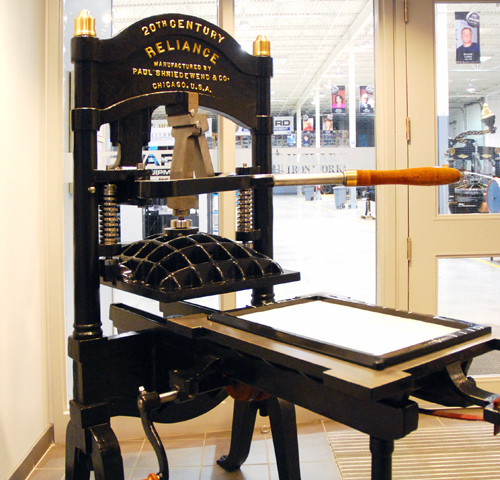 After splitting with Lee in 1893, Shniedewend went on to form the company that made this iron press. Lee became very successful in his new company: The Challenge Machinery Co. Challenge is still in business today. The Reliance was manufactured in Chicago although Shniedewend also built some machines in Germany. Platen size 21.25" x 27", Bed size: 24" x 30"